It has just come to my attention that you have to be careful where you buy Nintendo points and what you use them for. For those of you who don’t know: Nintendo Points are like Microsoft Points in that you pay cash for “credits” (i.e. Nintendo Points) and then redeem these against downlaodable software. Due to the high credit card processing fees for micropayments many companies have introduced a points scheme instead where the minimum amount say £5 or £10, however the items you can buy can be much cheaper. 1000 Nintendo Points cost you anywhere between £7 and £14.99! There are two options to get Nintendo Points: you can either buy them online directly from Nintendo via Credit Card from your consoles, or you can purchase a scratch card and enter a code that converts into points. Looks like retailiers can then charge whatever they like for those scratch cards. 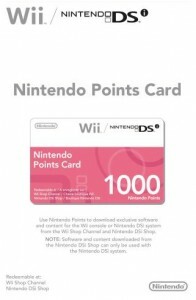 Nintendo Points can be purchased and/or redeemed both on the Wii and on the DSi systems. You’d imagine without the need to print a scratch card and ship them to a retailer this would be the cheapest option. But here’s the scam: if you buy 1000 points on the Wii they cost you £7. Buy the same 1000 points on the DSi and they’ll cost you £9. WTF? You won’t save money by buying larger quantities of points at a time online as the table below shows. Retailers prices for the same product vary widely – which makes you wonder how much they need to pay. Game and Gamestation charge you £9.99 for a 1000 point card and £19.99 for a 2000 point card. You’re actually SAVING 1p by NOT buying the bigger card. Go figure. The official retail price for a 1000 points card is £14.99 (cough!) – which is what you’d pay at Play.com . But you can get it at Amazon for £9.74 plus postage or from £7.47 plus postage on Amazon Marketplace. Play.com on the other hand charge you the full £14.99. It’s beneficial to buy the larger cards because they’re substantially cheaper with £15.19 for both Play.com and Amazon – yet it doesn’t quite make sense to buy the 3000 point card for twice as much. Careful where you buy your Nintendo Points. Looks like buying them directly from Nintendo online will result in a better deal than getting your hands on a scratch-n-sniff card. That’s exactly the opposite as in Microsoft Land: Microsoft Points are usually CHEAPER when you buy a card from say Play.com as if you buy your points online directly from Microsoft. Go figure. I’m glad to hear that the new Nintendo eShop for the 3DS will be a cash based system – maybe someone is already looking into these discrepancies.